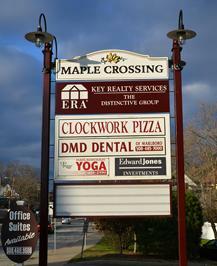 Marlborough Yoga is in Maple Crossing between Granger Blvd. (Rt. 20 Bypass) and Maple Street. The address is 19 Maple Street, Unit A. 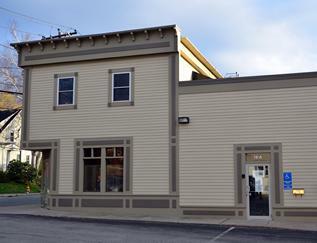 Other businesses in our building are DMD Dental, Clockwork Pizza, Edward Jones Investments and ERA Key Realty. We are at the end of the building on the second floor. A private entrance is just left of the door for Distinctive Realty. From Rt. 20 going West: Follow signs into Marlborough. Pass through the intersection of Rt. 20 Bypass and Main St. Turn LEFT into Maple Crossing. From 495 or Rt. 20 going East: Take Rt. 20 East (the Marlborough exit from 495). At the 3rd light merge RIGHT onto Rt. 20 Bypass. Go through 2 lights and take a RIGHT into Maple Crossing. From Route 85 toward Hudson: Take a RIGHT onto the Rt. 20 Bypass (Rockport Shoes is on your right). Turn RIGHT into Maple Crossing. Use the map below for reference or for door to door directions.